This issue sees the final pieces put into place to change Diana’s life forever – or at least until issue 204! 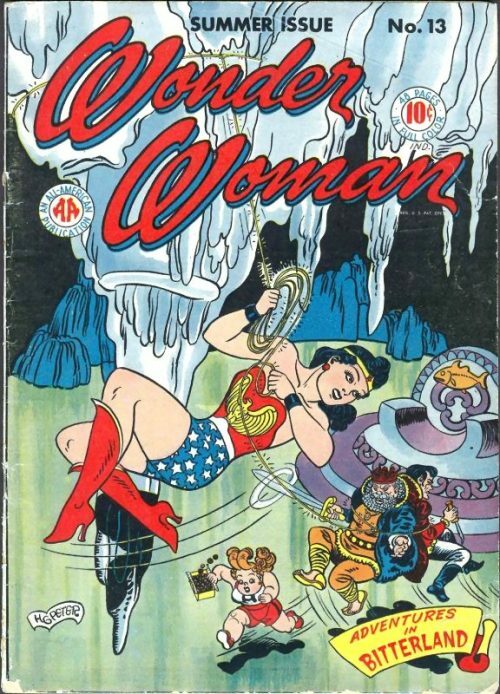 A rather rushed excuse as to why the Amazons must suddenly depart this dimension leaves Wonder Woman with the quandary as to whether to go with them or stay. She of course decides to stay because of Steve. As she bids farewell to her mother and mentor, she meets and gains a replacement in the form of a blind chinese man known as I Ching. 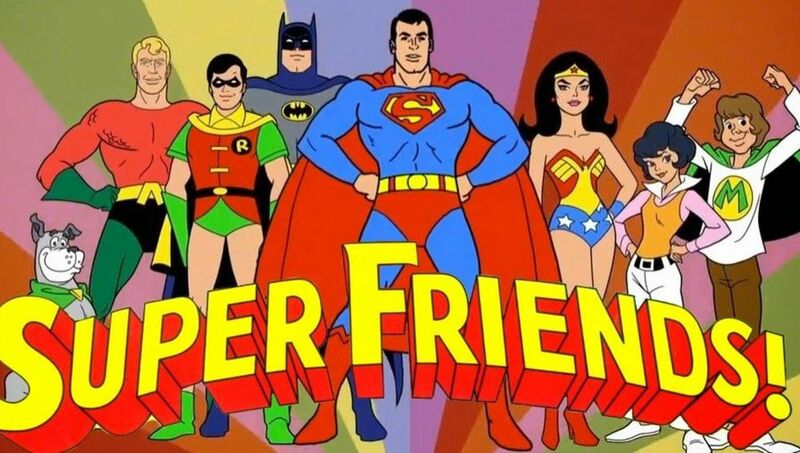 Together, over the next couple of years they form a unique double act to fight crime – but Diana does so without her costume, Amazon weapons or indeed her super powers. 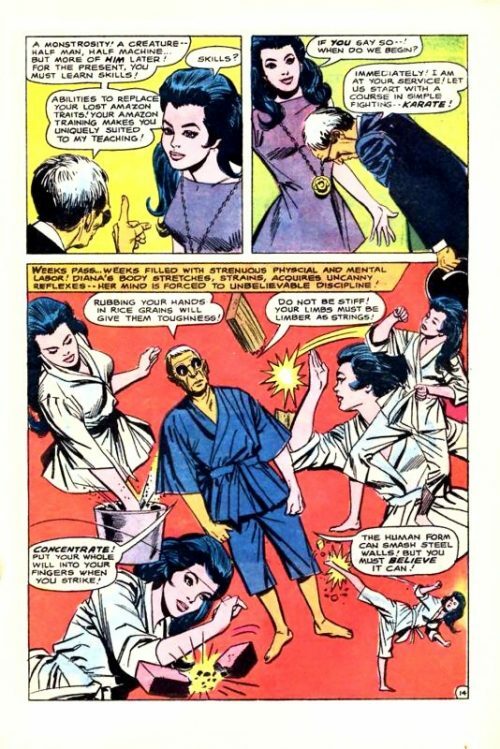 Relying on her newly acquired karate skills after training with I Ching, she faces Man’s World as more of a glorified secret agent in the tradition of such characters as Emma Peel or Modesty Blaise. 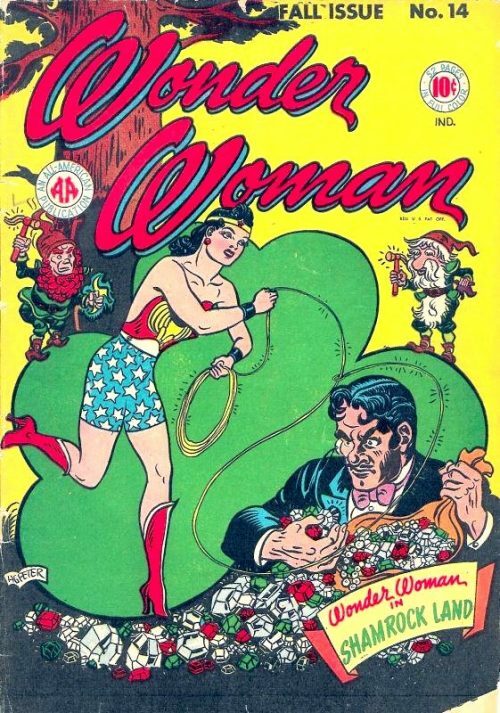 Apart from the fact that the comic book itself is still entitled “The New Wonder Woman”, there is scant little left of the great character that William Moulton Marston conceived back in the 1940’s. In General Darnell’s office, Steve is being briefed about a new dangerous mission. Darnell asks Steve whether he is sure he wishes to volunteer but the Major replies that he is committed to the welfare of the United States and he will do whatever it takes to keep it safe. General Darnell reminds him that as well as the danger aspect, Stave will have to bring disgrace upon himself as a traitor in order that he can infiltrate the criminal organisation they are targeting. With that, they agree that the mission should commence at once and Steve punches General Darnell, sending him flying! As he hits the General again, MPs rush in when they hear the commotion and Darnell orders them to seize Steve, who he accuses of being a spy. Steve has other ideas and instead decks the two guards and rushes out into the corridor. Hitting fellow officers is against everything he is but he knows that he has to make it believable. As the guards pursue him down the corridor he finds his exit blocked by more guards. As he tries another way he too finds that covered by MPs and as they close in he has no choice but to dive through the window and out into the parking lot. As they open fire on him he dodges the bullets and leaps into his car before speeding off up the road. The watching MPs assure General Darnell that Steve will not get far as they will have every military and civilian unit out looking for him. Darnell simply thinks to himself that he wishes Steve godspeed and that the world has become a rotten place to force him to lie like this. But the world will get a great deal more terrible unless they can bring Doctor Cyber and his high powered cut throats to justice! The following morning in a busy New York street, Diana Prince, sporting her new trendy civilian look, reads the newspaper headlines in shock as they recount how Steve is being hunted as a spy. As she watches the TV bulletins in a nearby store she cannot believe he is a traitor. He may have his faults but disloyalty is not one of them. 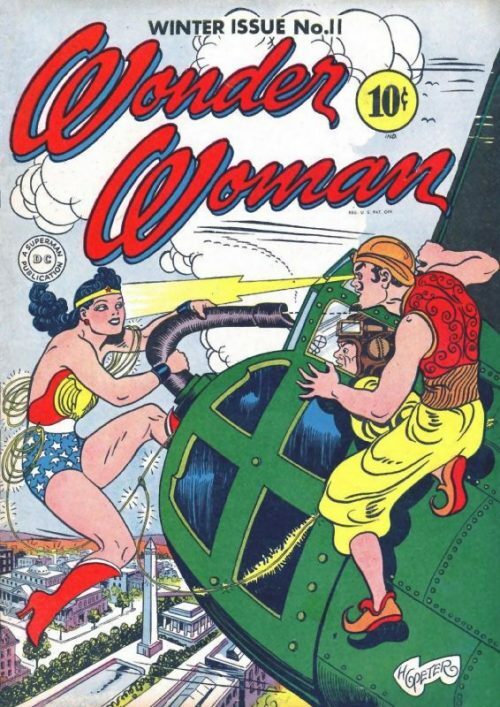 Perhaps Wonder Woman can get to the bottom of this. As she prepares to find a secluded spot to transform into her costume though she receives a telepathic message from her mother, Queen Hippolyta. She is instructed to return to Paradise Island at once and the Princess immediately obeys. Soon she is guiding her invisible plane over the tranquil island home of the Amazons and touches down near the palace. 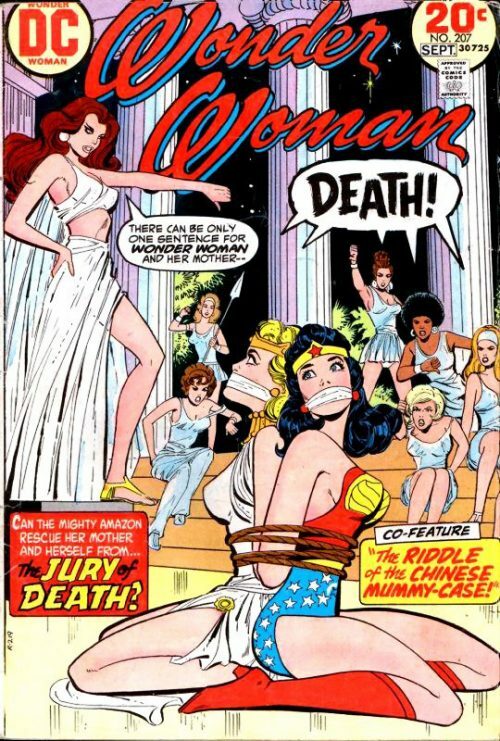 The fact that Wonder Woman is greeted in a formal manner by Hippolyta and her Amazon aides indicates to Diana that the occasion must be a solemn and grave one. Hippolyta tells Wonder Woman that she must make a decision. The Amazons time on Earth grows short. For ten thousand years they have lived here to carry out the mission that was assigned to them by the Gods. But in their efforts to help Mankind their magic powers are all but exhausted. They must therefore journey to another dimension to rest and renew their powers. The Amazons are tired and the ages weigh heavy upon them. Will Diana join them? Wonder Woman tells her mother that she loves her before hesitating. Hippolyta asks her to continue and the Princess says that Steve Trevor desperately needs her and she must stay in order to help the man she loves. Hippolyta bows her head and whispers”So be it”. 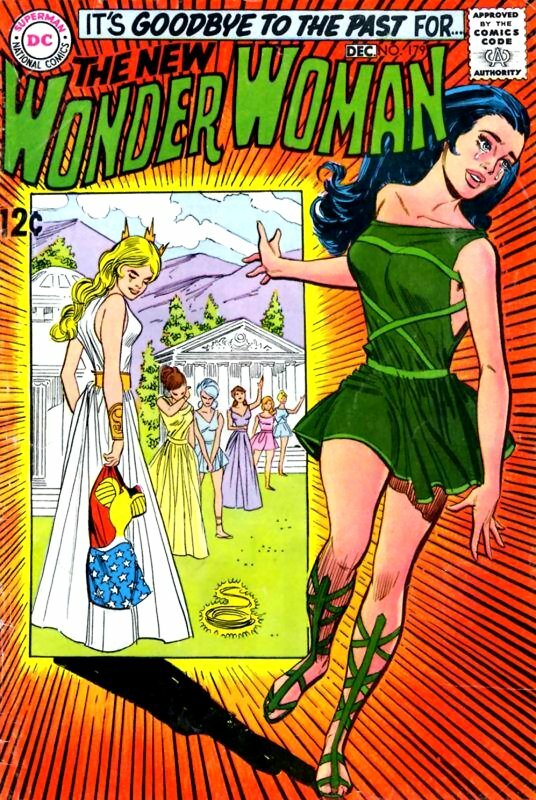 A short while later Diana has changed out of her Wonder Woman costume into a traditional Amazon gown and in the temple of Aphrodite, performs an ancient Amazon Rite of Renunciation. Relinquishing all mystic skills, she lays down her Wonder Woman costume, tiara, bracelets and golden lasso on the sacred altar. She then pronounces that she willingly condemns herself to the travails of mortals. With the ceremony over, she steps outside and hugs the waiting Hippolyta. As mother and daughter hold each other for perhaps the last time they weep. 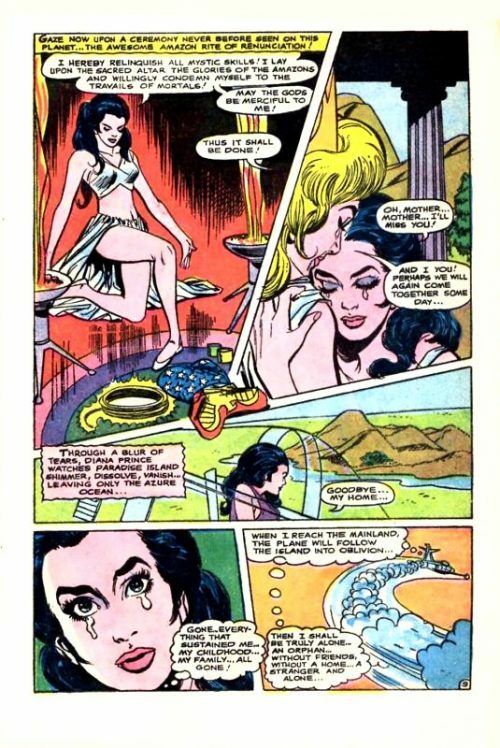 Diana then boards her plane and lifting off, watches through a blur of tears as Paradise Island shimmers, dissolves and finally vanishes completely leaving just the empty azure ocean below. Gone. Everything that sustained her…her childhood…her family…all gone! As she heads back towards the mainland she knows that the plane too will also vanish as soon as she touches down. Then she will truly be alone…an orphan without friends…without a home. And so Diana Prince ventures forth into a new world. The once renowned heroine find herself walking the pavements of lower Manhattan for the next few days. For the first time she in her life she is faced with practical problems. Finding a place to live and earning money for food. This neigbourhood she is in now is probably her best bet – not very high class but cheap! She muses on the irony that when Steve needs Wonder Woman most, all she can offer him is plain old Diana Prince – and a poor one at that! However, she is still determined to help him somehow. Soon she comes across a shop with an apartment above up for rent and wonders whether she could open some sort of small business here. Obtaining the key, she inspects the premises and although not lavish, thinks it will do quite nicely. She takes a look out of the back window to gauge what sort of outlook she has and suddenly sees below a group of hoods robbing a blind old Chinese man. As they demand money the old man asks them to let him pass. With no time to call the police, Diana quickly rushes down the stairs to offer assistance. But as she runs out into the alley way she is shocked to see a hood fly through the air past her as the chinese man pummels them into unconscious with expertly delivered karate chops! I Ching is the last surviving member of an ancient sect. Their monastery was hidden high in the mountains and their task was to maintain ageless knowledge lost centuries past – a time when men foolishly concluded that magic and science are different. Only the sect knew that they are sides of the same coin. In their Temple rested treasures of precious gems and metals. The agents of Doctor Cyber wanted them and so they struck! The sect resisted bravely but they were helpless before the attackers’ guns. Finally, all were dead accept I Ching, who himself was badly wounded. He was however able to escape and hid until the murderers left with their booty. Diana tells him that she does not blame I Ching for hating his enemies and he replies that he does not hate. He pursues Doctor Cyber for reasons of love! He loves humanity and if Doctor Cyber’s plans of conquest are realised, then men and women will be reduced to living automatons, helpless slaves to do his bidding. Diana asks who this Doctor Cyber is and I Ching explains that he is a monstrosity – half man, half machine. But they can talk more of him later. Right now she must learn new skills to replace her lost super powered abilities. Her natural Amazon training makes her uniquely suited to his own teaching. And so weeks pass, filled with strenuous physical and mental training. 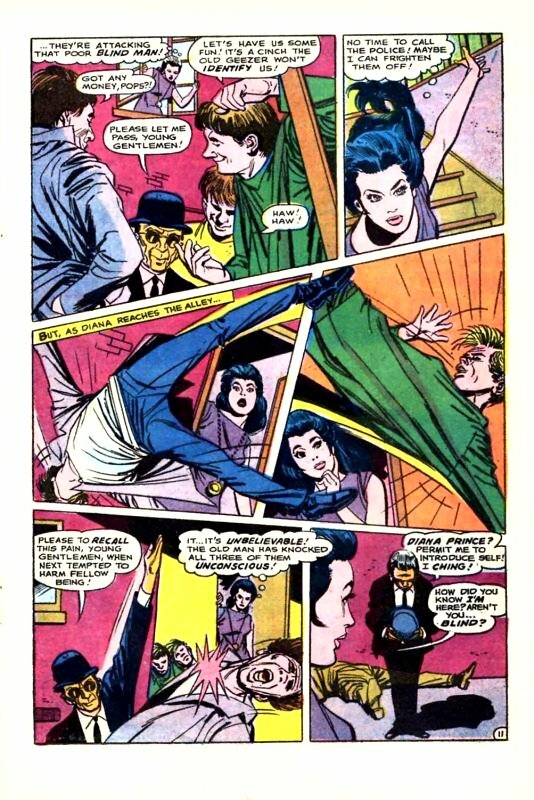 Diana’s body stretches, strains and acquires uncanny reflexes while her mind is forced to unbelievable discipline. She masters in a few short months the knowledge an ordinary woman would spend years acquiring. 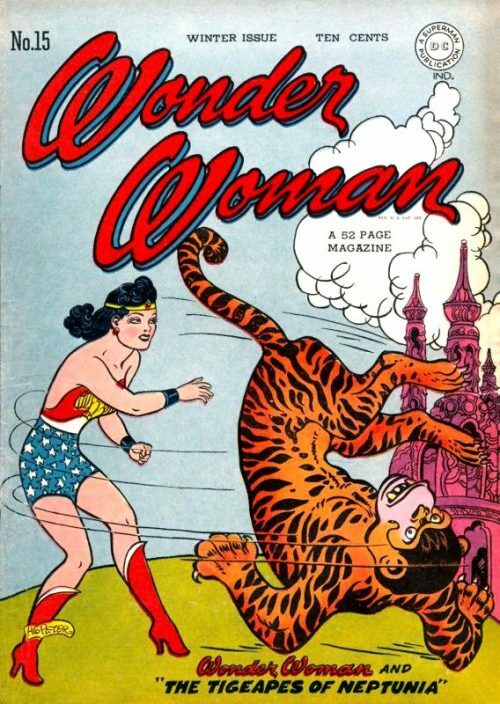 By day she practices the deadly battle arts of the orient and by night she questions underworld informers and studies the news columns seeking some trace of Steve Trevor. One day though, her training is cut abruptly short when Steve staggers into the gym, bleeding heavily from a gunshot wound. Diana and I Ching rush over to Steve as he collapses. As the chinese man summons an ambulance, Steve murmurs how Doctor Cyber had not believed his ruse of being a spy and had gunned Steve down, leaving him for dead. As she tells him to save his strength he continues to tell Diana that Cyber’s gang are hiding in an abandoned factory on the outskirts of the city. They are putting bombs into toys and plan to send them to Congressmen’s children to cause chaos and panic in the government. This will then make it easy for Cyber to step in and take over. Steve grimaces in agony and Diana weeps as the ambulance crew arrive and place her lover on a stretcher. As they carry him away he weakly asks her to find Wonder Woman and stop Cyber. As the ambulance drives off with sirens wailing, Diana wonders whether she is destined to lose everyone she loves? I Ching then chastises her for feeling self pity and to concentrate instead on the job at hand. “Soft emotions cloud Intellect” he tells her. She replies that she is not feeling “soft” but hatred towards Doctor Cyber. He responds in turn that hate will also interfere with their task. He indicates for her to follow him outside to where a car is waiting for them. As midnight strikes Diana drives the rental car towards an ominous black building ahead. I Ching asks her how she is feeling and she replies that in truth she feels a little frightened, as she has never faced criminals before without her Amazon powers. He tells her to put aside her fears and have faith in her instincts and abilities. As they approach the building their arrival is monitored via close circuit TV. A henchmen advises Cyber that they have company and he tells the hood that as he had let Trevor escape, this is his chance to make amends! Cyber adds that he has other things to attend to and that once the intruders have been dealt with, the men should join him at the main headquarters. With that he leaves as his men prepare their trap for Diana and I Ching. As their quarry steps inside the building a signal is given and the two friends find themselves under attack from deadly armed toys! I Ching warns her that their tiny swords carry poison which will kill instantly if allowed to pierce the skin! Diana instantly reacts and uses her newly acquired karate skills to deal with her attackers. She makes good progress slicing through the toys until suddenly her hair is grabbed by a huge Frankenstein toy! She unleashes several deadly blows but fails to stop the creature’s advance. I Ching yells that each figure has a heat seeking device in the body and that she must smash the engine in the solar plexus. She obeys and fells the mighty toy. The watching henchmen realise that this will not be quite as easy as they had hoped and next launch a wave of toy planes. Diana and I Ching are strafed by miniature machine guns and the gang uses the distraction to get around behind the pair. As Diana and I Ching smash the planes in mid air the gang advance and the Amazon catches sight of them. She leaves the chinese man to finish off the planes while she turns her attention to the hoods. Again her deft karate skills lays low the entire gang except the leader who raises his weapon to fire. But a final plane swoops down and picks up his body heat, opening fire and mowing him down from behind. Some time later in a hospital, Diana and I Ching visit Steve who lies unconscious in his bed. The doctor advises them that Steve is in a deep state of shock from the beating and gun wounds. To be honest it is a miracle he is still alive and they cannot tell how extensive the damage is and if there is any brain damage or not. A tear trickles down Diana’s cheek as she bends over and gently kisses Steve on the lips. She whispers for him to get well soon. Outside, Diana tells her chinese companion that she is exhausted and a little numb. Her life has changed so much in so short a time. He replies that she cannot rest as they have only just begun. Doctor Cyber is still free and they must bring him to justice!